S-5! PV Edge Grab Kit can be used with S-5! Mini Clamps, S-5! CorruBrackets and S-5! VersaBrackets to mount solar modules. The concept of combining photovoltaic arrays with standing seam metal roofing is growing— and for good reasons. A standing seam metal roof has a life expectancy consistent with that of framed PV modules. A 30-year power source on a 40-year roof, along with zero-penetration technology creates the most sustainable roof system available with alternative power generation, all without compromising the roof's warranty! The S-5!® EdgeGrab™ and S-5-PV Kit together accommodate PV frame thicknesses 30–48 mm (if the L-flange is positioned below the stud's hex nut) and 34–51 mm (if the L-flange is positioned above the stud's hex nut). The embossed panel guide makes the module placement easier. The mounting disk is multi-directional and rails are not required. Flat mounting disks are available for use with the S-5! VersaBracket™ for exposed-fastened trapezoidal profiles. Four strategically placed under-disk hooks assist in wire management. The PV grab ears that hold the solar panel in place are broader to allow for ease of installation and precise module engagement. Accommodating module thicknesses between 30 and 51 mm, the S-5-PV Kit fits the majority of solar panels on the market. Using the S-5! mini clamps, it fits most standing seam metal roofs. When paired with other S-5! products, the S-5-PV Kit and EdgeGrab will work on most exposed-fastened and corrugated metal roofs. 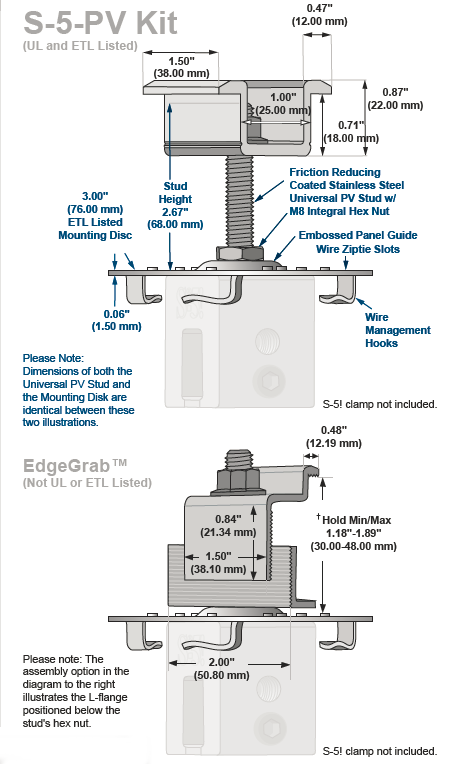 The standard grab is designed to fit field conditions (two adjacent panels), while this new EdgeGrab is designed specifically for end conditions. The PV Kits can be used with S-5! Mini Clamps, S-5! CorruBrackets and S-5! VersaBrackets to mount solar modules. Incredible holding strength that only S-5! can offer. Diagram S-5! PV-Kit mounted on top of the S-5! Mini Clamp - both of which are purchased separately from the EdgeGrab.